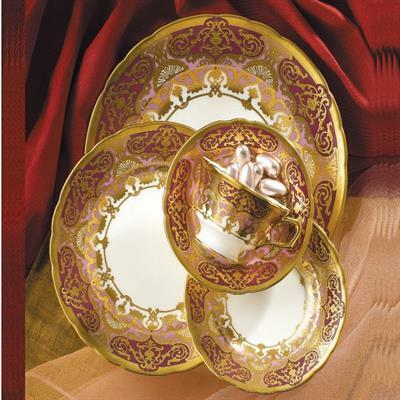 In our long history there has been a rich heritage of exquisite tableware and this new design is no exception. Our commitment to quality is the same today as it was in the 18th century. The finish on this new range of lavish tableware has been achieved by creating skills and techniques that were in danger of being lost to the past. Hand applied 22ct gold is carefully laid on an almost infinite choice of background colours, and after being fired up to eight times we are able to produce yet another exquisite example of Royal Crown Derby craftmanship.